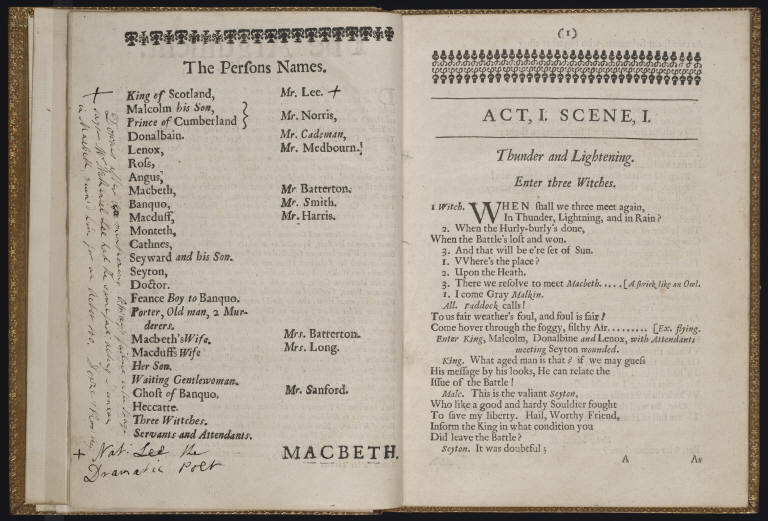 Long after its publication in the 1623 First Folio of Shakespeare’s works, Macbeth remained a play of popular appeal, and what it offered audiences of the seventeenth century was not so different from what it offers audiences today: at a grand scale, the seduction of ambition; and at a smaller one, ghosts and witches. 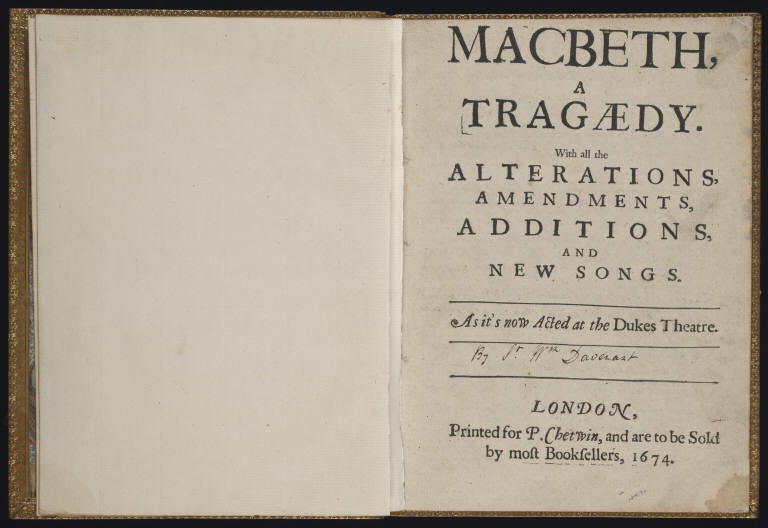 This 1674 edition of Macbeth, coming long after the tragedy’s original publication, sheds some valuable light, through its deviations from the original, on the persistent appeal of the equivocating women who “look not like th’inhabitants o’th’earth / And yet are on’t.” With their entry onto the stage, the witches of the later version speak with an agency that is not quite there in the First Folio version. Witch 1: Where’s the place? Witch 2. Upon the Heath. Witch 1. I come Gray Malkin. To us fair weather’s foul, and foul is fair! Witch 1: Where the place? Witch 2: Upon the heath. Witch 3: There to meet with Macbeth. Witch 1: I come, Gray Malkin. Hover through the fogge and filthie ayre. Slight as it is, the addition of “To us” and “we resolve” in Clark’s edition of the play adds a measure of agency to the famous sorceresses, making them into more tangible characters, possessing a visible desire to act upon Scotland’s future king and, with it, a psychology to attract Shakespeare’s post-Restoration audiences.